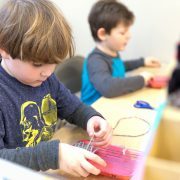 There is no reason children shouldn’t be in a Montessori environment all year long. Join the discussion as we explore what our Summer Program would look like if we shifted to Montessori instead of more traditional camps. If you plan to attend (Wednesday, November 14 from 12:30-1:30 in the FCM Conference Room), please RSVP to Brittany. We hope to see you there! This session will take place in the FCM Multi-Purpose Room, will be accessible the day of via Google Hangouts, and will also be recorded. You are welcome to bring your lunch if you wish. Sign up here to attend in person. Questions? Email Angie Ma.